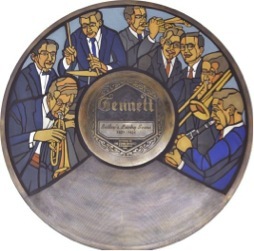 June 13th in Gennett History, 1923: Bailey’s Lucky Seven recorded “Pickles” in NYC. It appeared on Gennett 5197 and Starr-Gennett 9418. The track featured Phil Napoleon and Jules Levy Jr. (c), Charlie Panelli (tb), Benny Krueger (sax), Jimmy Lytell (cl), unknown (p), and Nick Lucas (d). This entry was posted in Gennett, Gennett Walk of Fame, June and tagged Bailey's Lucky Seven, Benny Krueger, Charlie Panelli, Gennett, Gennett 5197, Gennett Discography, Gennett Records, Gennett Walk of Fame, Jimmy Lytell, Jules Levy Jr., June, Nick Lucas, Phil Napoleon, Starr-Gennett 9418. Bookmark the permalink.